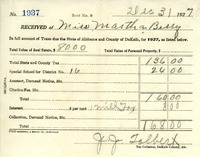 Martha Berry requests the amount of her taxes for the land she has in Newton. 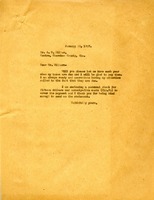 K. H. Davis, R. T. R. (?) 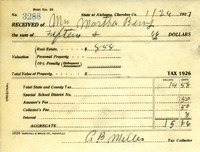 sends a receipt for property taxes to Martha Berry. 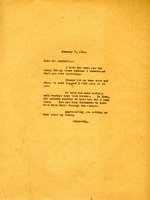 Included with the handwritten letter is a an official form entitled 'White Tax Payers' Returns of Property for Taxation' that lists amounts and value of property and holdings in Dade County, GA.
DeKalb County acknowledges receipt of payment for fees on taxes for land in DeKalb County. 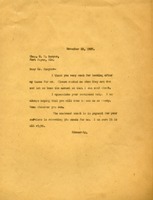 Martha Berry thanks Mr. Sawyer for recording land deeds and looking into the taxes. She sends him a check for his services. Miss Berry asks to be notified when her taxes are due. She also sends a personal check for her payment to him. 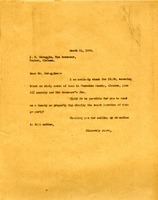 This is a memorandum statement to Martha Berry from E.F Hutton & Company acknowledging a charge on the account for $2.00 for taxes. 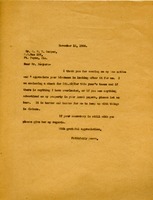 Martha writes to Mr. Scroggin with a check covering the taxes on the land in Cherokee County Alabama. 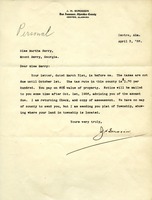 Martha recieves a letter about the tax rate in Cherrokee County on the land. Information, she is told will be sent after Oct. 1st advising of the amount due.